Antibiotic Resistant “Superbugs”: Soon To Kill Millions? Due To Meat & Dairy? Biodiversity Loss & Mass Extinction Also Threatens Our Future. Food Choices Affect This. Climate Change & Pollution: How Much is Due to Meat & Dairy? Dying Oceans: Overfishing, Seafood Consumption, Plastic & Pollution from Meat & Dairy Industry. Common Nutritional Deficiencies in Developed Nations. 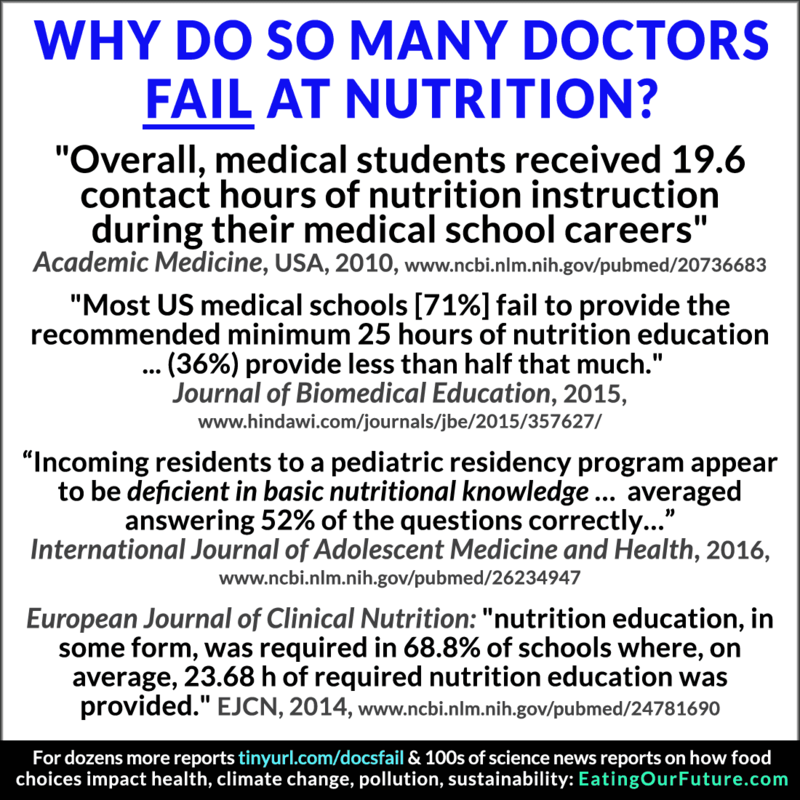 Doctors Fail at Nutrition from Lack of Education. Eating Red Meat & Higher Rates of Cancer, Heart Disease, Diabetes, Death. Dairy Consumption: Higher Rates of Mortality, Cancers, Bone Fractures, CVD, Parkinsons & Hormone-related Diseases. Diabetes Risks Raised by Eating Meat & Reduced by Plant-based Diets. Egg Consumption & Higher Rates of Cancer, Diabetes, Heart Disease & Mortality. Fish Seafood Consumption Not Healthy? Studies find Higher Rates of Disease. Infertility from Saturated Animal Fats & Hormones via Meat, Dairy & Chicken Eggs? Paleo Diet is PseudoScience? Problems Debunked & Exposed? Food Politics: The Influence of Meat & Dairy Industry on Government, Education, News, Media & Health Professionals. Health Benefits of Plant-based Diets: Science Reports on Vegans & Vegetarians. Fruits & Vegetables Lower Risks of Cancer, Cardio-Heart Diseases & Overall Mortality? Healthier Longer Life via Unrefined Carbohydrates? Iron: Higher Disease Risks of Animal Heme Iron; Deficiency is Rare on Plant-based Diets. Mental Health Improved by Anti-Inflammatory Plant-based Diets? Nuts: Reduced Disease Rates & Improved Longevity. Plant Protein: Healthier than Disease Risks of Eating Animal Protein. Soy Foods: Studies & Doctors Report Great Health Benefits & Debunk Myths. Human Evolution: Brain Intelligence Evolved via Plant-based Diets? Allan Savory Debunked: claims for cattle grazing refuted. Dr Albrecht Glatzle DEBUNKED? Meat Industry Farmer. Legion Athletics “9 Lies Vegans Love To Tell” – Debunked, Refuted. Nina Teicholz Debunked: pro-fat, meat, eggs & dairy health claims refuted. Your Personal Impact: How Many Animals Are Killed For a Lifetime Consumption of Meat & Seafood – 2,000? 10,000? 87,000? 121,000?!? Reports on Why So Many Medical Doctors Lack Knowledge about Nutrition – of How Healthy Food & Lifestyles can Prevent, Treat & Reverse Disease – for they receive only several days of training during college; reports from science journals & news media regards the USA, UK, Europe, Australia, Japan. Excerpts: “Even though the most widely accepted, well-established chronic disease practice guidelines uniformly call for lifestyle change as the first line of therapy, physicians often do not follow these guidelines. The Guardian (2016) reports: “Doctors ‘know too little about nutrition and exercise’” Excerpts: “Most doctors are ill-equipped to tackle Britain’s increasing frequency of lifestyle-related diseases because they know worryingly little about how nutrition and exercise can improve health, a group of prominent medics has claimed. BBC March 2018 re: UK – “Medical students say they currently learn almost nothing about the way diet and lifestyle affect health – and they should be taught more. But doctors are not being trained to deal with what medics call non-communicable diseases – and it’s those kind of illnesses that are threatening to bankrupt our health system, so a new kind of training is crucial. This site contains pages with hundreds of science reports on the higher rates of disease & death associated with eating red meat, dairy, chicken/poultry, eggs, fish/seafood & of the lower rates associated with eating healthy plant-based diets high in fruits & vegetables & nuts. Summary: “What might happen if nutritional excellence was taught in medical school? Most deaths in the United States are preventable, and related to nutrition. Given that the #1 cause of death and the #1 cause of disability is diet in this country, surely nutrition is the #1 thing taught in medical school. Sadly, that is not the case. Details of the survey: “The current questionnaire was sent to the directors of Centers for Medical Education of 80 medical schools, who represented all medical schools in Japan. Sixty-seven medical schools (83.8%) responded, of which 25 schools (37.3%) offered dedicated nutrition courses and 36 schools (53.7%) did not offer dedicated nutrition courses but offered something related to nutrition in other courses; six schools (9.0%) did not offer any nutrition education. Overall, 61 schools (91.0%) offered at least some nutritional topics in their undergraduate education. Excerpt: “In the United States, most deaths are preventable and related to nutrition. Given that the number-one cause of death and the number-one cause of disability in this country is diet, surely nutrition is the number-one subject taught in medical school, right? Sadly, that is not the case. As shown in my video, Physicians May Be Missing Their Most Important Tool, a group of prominent physicians wrote in 2014 that “nutrition receives little attention in medical practice” and “the reason stems, in large part, from the severe deficiency of nutrition education at all levels of medical training.” They note this is particularly shocking since it has been proven that a whole foods, plant-based diet low in animal products and refined carbohydrates can reverse coronary heart disease—our number-one killer—and provide potent protection against other leading causes of death, such as cancer and type 2 diabetes. So, how has medical education been affected by this knowledge? Medical students are still getting less than 20 hours of nutrition education over 4 years, and even most of that has limited clinical relevance. Thirty years ago, only 37 percent of medical schools had a single course in nutrition. According to the most recent national survey, that number has since dropped to 27 percent. And, it gets even worse after students graduate. According to the official list of all the requirements for those specializing in cardiology, fellows must perform at least 50 stress tests, participate in at least 100 catheterizations, and so on. But nowhere in the 34-page list of requirements is there any mention of nutrition. Maybe they leave that to the primary care physicians? No. In the official 35-page list of requirements for internal medicine doctors, once again, nutrition doesn’t get even a single mention. Quotes from news reports & science journals on how the Western omnivore diet with meat and dairy products accelerates climate-change through: i) increasing our carbon footprint of greenhouse gases; ii) deforesting & destroying wilderness that absorbs carbon and protects biodiversity; iii) creating massive pollution; and iv) wasting resources like grains, water, fuels and agricultural lands. Excerpts & links to medical studies, articles & reports on the links between meat consumption and increased incidences of cancer, heart disease, diabetes and early mortality (a shorter lifespan); also to reports on how cancers are increasing in young people. Quotes & links to articles in science, medical & health journals that report great benefits vegetarians and vegans generally have including longer lives with less of the chronic degenerative diseases like cancer, cardiovascular heart disease, diabetes, osteoporosis and obesity as well as lower blood pressure, hypertension and blood cholesterol levels. Excerpts & links to articles in news media science journals about the current ‘Sixth Mass Extinction’ known also as the ‘Holocene Extinction’ or ‘Anthropocene Extinction’ as it is largely caused by human activities. This page contains quotes & links for studies & articles in science journals, news media & by medical doctors; on the association of drinking milk to higher rates of osteoporosis, cancer, heart disease and other illnesses. This page features quotes & links to articles in news media and science journals about the rise of microbes that are resistant to antibiotics; posing a grave threat to all of us; from 50% to 80% of antibiotics are (mis-)used in animal agriculture industries. This page features quotes & links to reports that expose how the animal agriculture industries (meat, dairy, poultry) influence government, politics, the education schooling system and news media in order to promote their interests. Excerpts from articles about the marine ecosystem collapse that is happening now in oceans, seas & rivers due to over-fishing and the toxic pollution in waterways from land-based animal agriculture meat-farming; worsening climate change; threatening the entire food chain. Articles from science journals & news reports that dispute the health claims made regards eating fish; some even find higher rates of heart disease and cancer among seafood consumers.